To summarize the available scientific information on the effects of workplace noise exposure during pregnancy. The studied effects on pregnancy are: spontaneous abortion (SA), stillbirth (SB), congenital anomalies (CA), preterm delivery (PTD), low birth weight (LBW), small-forgestational- age (SGA) infant, pre-eclampsia (PE) and gestational hypertension (GHT). The effect of workplace noise during pregnancy on the child's hearing is also addressed. 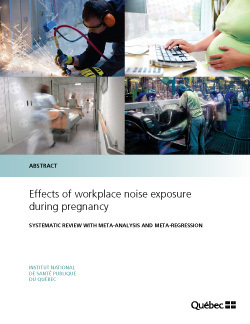 First, two bibliographic searches, one in Medline and the other in Embase, were performed to identify the original epidemiological studies that evaluated the effects of workplace noise on pregnancy. Studies published in French or in English between 1970 and August 2008 were selected. The bibliographies of the articles and the personal files of the author completed the list of the articles for consultation. There was no systematic search for unpublished material. The present review covers 27 articles. Another search in Medline then identified three studies estimating the effect of workplace noise during pregnancy on the child's hearing. Each study was systematically evaluated regarding the following aspects: design and size of the study; external validity; population studied (method of selection, rate of participation); effect on pregnancy or on the child’s hearing (definition and measurement); noise exposure (definition, comparison group, measurement method); and confusion control (personal factors and other occupational exposures). In addition to a validity score, these aspects allowed a level (low, moderate or high) to be established for the risks of selection bias, information bias regarding exposure, and confusion bias related to personal factors or other occupational exposures. For each effect (on pregnancy or the child’s hearing), if the results could be combined, a meta-analysis was performed to obtain a summary (pooled) measure of association (SMA), to evaluate the presence of heterogeneity, and to do sensitivity analyses (sometimes analyses by sub-groups) useful during evaluation of validity and sources of heterogeneity. For certain dyads, when the number of studies was sufficient, a metaregression was performed. This method completed the meta-analysis and allowed an adjusted SMA to be obtained simultaneously for the different risks of bias. The search for a publication bias was done by examining a funnel plot. The magnitude of the effect corresponding to each dyad was estimated from the SMA of the meta-analysis or by the adjusted SMA obtained by meta-regression, when available. Finally, the strength of the evidence was classified in one of the seven levels described below, after evaluation of the following criteria: biologic plausibility, statistical accuracy, validity and coherence. The results are presented in the summary table below; it shows the magnitude of the effect, the criteria used, and the classification of the strength of the evidence for each dyad evaluated. For the eight effects on pregnancy, biologic plausibility was considered good in the presence of a sound level of at least 85 dBA or a lower sound level if the task required high concentration or significant mental effort; otherwise, the biologic plausibility was considered as average. In the presence of exposure that corresponds to an average biologic plausibility, the strength of the evidence will be modified for SA and SGA. It will go from III to IV for SA and from II to III for SGA. In the presence of noise exposure in the workplace, sufficient evidence of a 27% increase in the risk of SGA was noted. A suspicion of increased risk for four effects on pregnancy exists: SA (6%), PTD (13%), PE (12%) and GHT (42%). Finally, the data do not allow a conclusion regarding the risks of SB, CA, LBW and of hearing loss in the child.